The Cordillera Huayhuash is a compact but spectacular 30 km long cluster of summits in the Peruvian Andes. It lies south of the Cordillera Blanca and some 360 km from Lima at the coordinates: 10°16′S 76°54′W. The mountain range is comprised of dozens of snowy peaks. Its highest point is 6634 m Yerupajá, Peru’s second highest summit after Huascaran, and it is also the location of Siula Grande, the scene of Joe Simpson and Simon Yates’ epic adventure, which inspired the book, “Touching the Void”, and which was later made into the movie of the same title. From the melting of the alpine ice and snow, beautiful lakes, rivers, and streams are born, which flow to both the Atlantic and Pacific oceans. Some of the better-known lakes are: Jahuacocha, Carhuacocha, Mitucocha, Sarapococha, and Rasac. The Cordillera Huayhuash is the site of the famous “Huayhuash Trek”, which is considered one of the “ten best treks in the world”. There are now several alternatives due to the recently improved access, allowing trekkers to experience this classic route in less than the traditional 12 days. 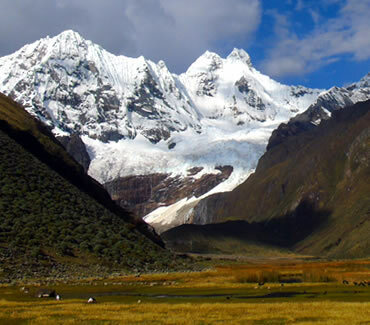 The Cordillera Huayhuash was completely unprotected until the year 2002, when it was declared a “Reserved Area” by Peruvian government. These days the communities (villages) situated around the mountain range, who are the actual owners of these lands, have converted their respective holdings into private protected areas, which they themselves manage. Among the communities that are recognized by Peruvian governent: Llámac, Queropalca, Huayllapa and Pacllon.